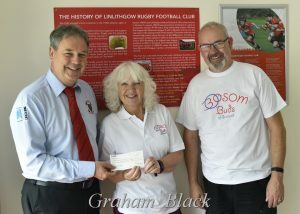 The photo shows rugby club President, Ken Richardson, handing over a cheque for £270 to Mags Fenwick of Bosom Buds with Derek Mair looking on. 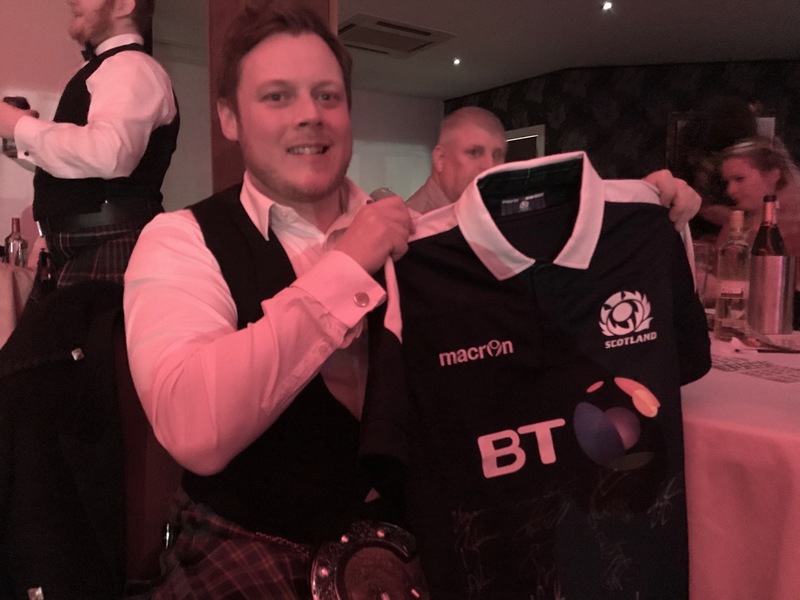 When local fireman Derek Mair won a signed Scotland rugby strip in a prize draw raffle, he saw the opportunity to raise money for two local causes – charity Bosom Buds (of Scotland) and Linlithgow Rugby Club. Enlisting the help of Rugby Club President, Ken Richardson, he offered the strip for auction so that the two local causes would benefit. As the Rugby Club also have close ties with Bosom Buds, it was agreed that Bosom Buds would benefit from three-quarters of the proceeds, with the balance going to supporting youth rugby in the town. 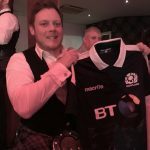 The rugby club then put the Scotland strip up for auction at the Club’s annual dinner dance and awards evening, where it drew a winning bid of £360. On accepting the cheque on behalf of Bosom Buds, Mags Fenwick thanked Derek for donating the strip and for his vision to use it to raise money for the two local causes. “All the money Bosom Buds receives goes directly to spending on charitable deeds as the charity is run entirely by volunteers” she pointed out. Rugby club golf event organiser, Mark Wells, presents a cheque for £500 to former Scotland rugby cap and Foundation Director Alan Lawson with Kingsfield’s Stuart Johnston looking on. When Linlithgow Rugby Club held its Golf Day at Kingsfield back in late April, it had been agreed that the event would seek to raise money not only to support youth rugby in the town, but also for the Bill McLaren Foundation – a charity set up in memory of the great Scottish rugby commentator. Robert Arkley very kindly made the Kingsfield Golf Course available for the day and 16 teams of four, featuring local businesses and rugby club members, took part in the Texas Scramble event. 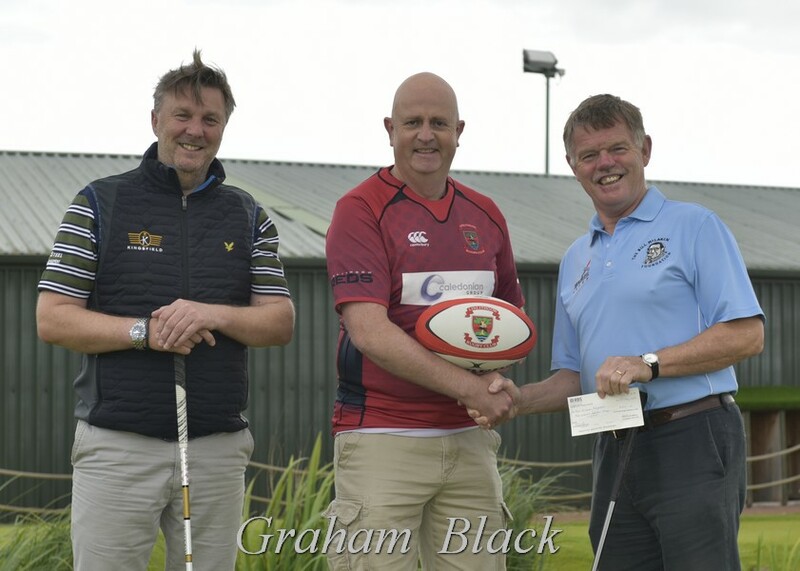 It was a great day and the event raised £500 for the Bill McLaren Foundation – an organisation that helped Linlithgow Rugby Club with its fundraising three years ago for the indoor training centre at Mains Park. Rugby Club President, Ken Richardson, expressed his thanks to Robert for letting the Rugby Club use Kingsfield for the day and to Mark Wells and his team for organising such a successful and enjoyable event. “Thanks to Robert’s generosity and the efforts of our event team led by Mark not only was it a great day, but we also raised money which will benefit young people both in Linlithgow and across Scotland, in helping them to participate in sports (and rugby in particular) for enjoyment, health and personal development. It is great for us to be able to give something back to the Bill McLaren Foundation after their huge support when we were fundraising for the indoor training centre three years ago”.